Happy new year -- I've got some resolutions to make. You may not know this, but I started this blog on New Year's Day - so the blog is now 5 years old. Back then, I had only been knitting for 6 months and had just learned to spin -- and as I said in my very first post, "I fear where my fiber obsession may lead me next." And it has led me many places indeed! I've met so many amazing crafters, visited places I never thought I would, found a fulfilling creative outlet with designing and even had my designs published. What a ride! There's no question that I've fallen hard for yarn, fiber, and everything woolly (and alpaca-y, angora-y, silk-y...). So of course, over the past 5 years I've accumulated some yarn. A lot of it. And lots of pretty patterns that I "need" to knit. It's time to knit down the stash. 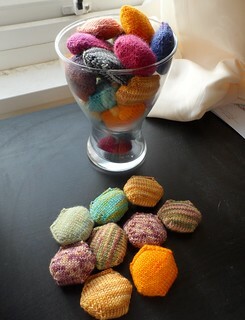 According to Ravelry, I've got (gulp) 146 yarns in my stash. Now some of those are things like spindles, Tour de Fleece logs, and other non-stash things, but it's safe to assume there is also probably some yarn in my stash that hasn't been put on Ravelry. My goal, a fairly modest one I think: at least one FO from stash, per month. Last year, I finished 19 projects, but a number of those were designs and thus not from the stash. In fact, I would say only about 6 of the projects I finished last year were 'from stash' - meaning the yarn was not provided for me, nor did I buy the yarn specifically for the project. I've set up a personal sock club for myself: 6 pairs over the next year. These are patterns and yarns I've wanted to knit up for ages and ages, and it's finally time. Over the past few years I've come out of my sock knitting phase and leaned more towards shawls, and most of my socks are full of holes or darned beyond recognition now - I need some new pairs! I also resolve to make more hexipuffs, because I have sorely neglected them lately and my goldfish bowl of yarn leftovers is starting to overflow. So, by the end of 2013, I will have no more than... 134 stashed yarns and 333 patterns queued. Sigh. Progress is slow. Let's hope I can overshoot my goals! Those all sound like really excellent goals. Trust me, handknit socks are a real pleasure to wear. And I love knitting with handspun, though I don't do it nearly enough as I'd like. Natural dyeing I haven't tried - best of luck with it! That's a lofty goal, but totally doable! I'm always trying to control the stash, and a recent moth infestation lit a fire under me to use up more stuff in the closet. I'm looking forward to seeing your hexipuff progress!